A detailed user’s guide on Dynamic Facilitation for organizational consultants, facilitators, and mediators. As group facilitators, we can use methods like Open Space Technology, Future Search, and World Café to reliably evoke “group magic” when working with larger groups. Yet how can we tap into the generative power of self-organization when working with smaller groups – especially ones facing complex and conflict-laden issues? In From Conflict to Creative Collaboration: A User’s Guide to Dynamic Facilitation, Rosa Zubizarreta introduces a highly effective and agile way to welcome groups into a co-creative “flow zone” – where participants create practical and innovative solutions while building trust, empathy, and authentic community. 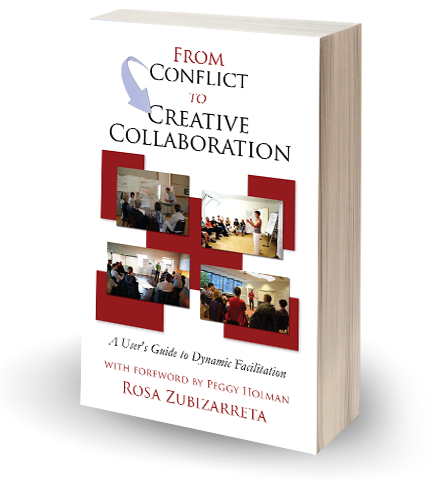 Zubizarreta describes a ground-breaking approach that anyone who works with groups can use for transforming unproductive friction into shared understanding, breakthrough thinking, and high-functioning teamwork.